STRONGEST HOSE AVAILABLE - Our Forever Steel 304 Stainless Steel garden hose is Ultra-Durable, Ultra-Flexiable and stronger than other hoses. The Stainless-steel construction of this lawn hose makes it lightweight, durable and kink-free. This hose is extremely durable and contains nickel and chromium giving it its corrosion resistant properties. Fresh and clean water always, and the pipe looks as good as new all year long. The stainless steel simply reflects the rays and does not absorb any component of the light. The metal garden hose is completely impervious to the effects of UV radiation. Every two garden hose can be connected to make it longer as required. Support varying sprayers for multiple purposes. Solid outer metal coating, the metal hose is very sturdy even go around sharp corners or dog chew. Do not leave the garden hose unattended when in use. Store it in the shade in a cool place after drying when not in use. ADVANCED FLEX RIDGE DESIGN - Forever Steel Hose is flexible enough to keep working in any condition and will never tangle or kink. PUNCTURE PROOF - Puncture Proof, Weather Proof, Thorn Proof, Dog Proof, Kink Proof, Leak Proof, Tear Proof, Weather Proof - The one garden hose you will own forever! LIGHTWEIGHT AND COMPACT - Encased in a sturdy stainless-steel outer layer allows for a consistent, steady and high-pressure water output. 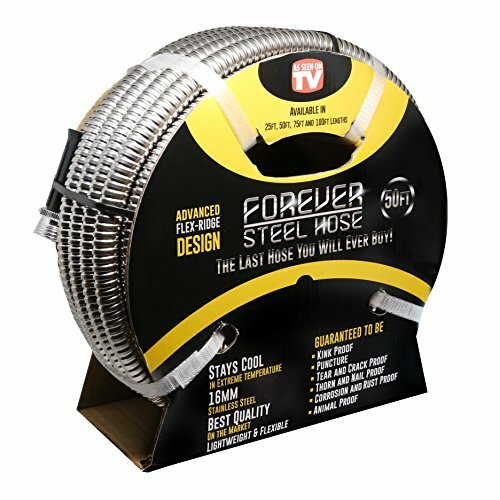 If you have any questions about this product by Forever Steel Hose, contact us by completing and submitting the form below. If you are looking for a specif part number, please include it with your message.